While the ProForm 645 treadmill is beloved by many, the ProForm brand doesn’t always deliver quality with their fun gadgets and features. Knowing that some of ProForm’s treadmills are a little iffy in terms of quality, the ProForm 645 treadmill has been tested rigorously by experts such as the Treadmill Doctor. The motor is slower than most beginners’ models, which might cause two things – a shorter overall treadmill life as well as no room for improvement if you are looking to really train on this treadmill. The heart rate monitoring method of grip sensors is one that many ProForm treadmills employ now, but they can be difficult to hold onto when running. Some testers found that they were inaccurate as well, lessening their confidence in getting an accurate pulse reading. Experts found the ProForm 645’s running surface to be ample, even if the actual running area is not given by the ProForm manufacturer. It’s slightly smaller than some runners might like, but for beginners and those new to using a treadmill, this won’t present a problem. The 90 day parts and labor warranty leaves a little to be desired, in keeping with the ProForm problems with quality. It almost sounds as though ProForm is expecting you to have problems by the short length of this warranty. 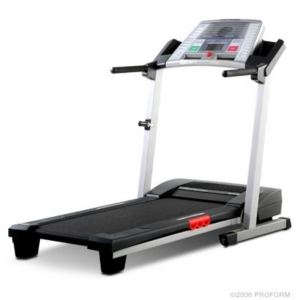 You should also note that ProForm treadmills are continuously updated, so getting parts for the Proform 645 can be problematic after a year or so. While we know that many people love the ProForm brand, lots of consumers have been burned in the past in terms of quality. The ProForm 645 looks like it is a step up from past models; however, it also seems to be built to last for only a few years. So, if you’re not sure that you will stick with your treadmill exercise program, this treadmill might be the right fit for you. 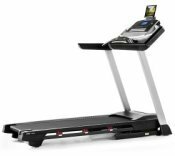 But if you’re looking for a treadmill that really goes the miles, you might want to look at another model besides the ProForm 645 treadmill, like the ProForm Crosswalk or ProForm 6.0 GSX.